Janice is a wife, mother to 3 adult children and business owner. As often as her schedule allows you will find her enjoying one of her greatest passions in life; hiking in the White Mountains. Janice feels a connection to White Mountains history and is fascinated with the stories and legends of each of the mountains she hikes. She often feels like she is taking a step back in time while hiking as the pioneers of the region hiked past the same landscape and trees and over the very same boulders we’re hiking on today. In addition to her fascination with the rich history of these mountains, she enjoys inspiring and motivating others to get out and hike, breaking down any barriers to why they think they are not able. Hiking these mountains has changed Janice’s life and she intends to share this passion with everyone that will listen. Have you ever experienced an unsettling feeling or ‘the willies’ while hiking on particular trails? For no reason you suddenly feel unease, your pace quickens and your heart pounds a little…you look around expecting someone or something to be looking back but see nothing and keep moving assuring yourself it’s all in your head? Hiking Mt. Willey in the area of the Willey family tragedy just might give you these feelings. Mt. 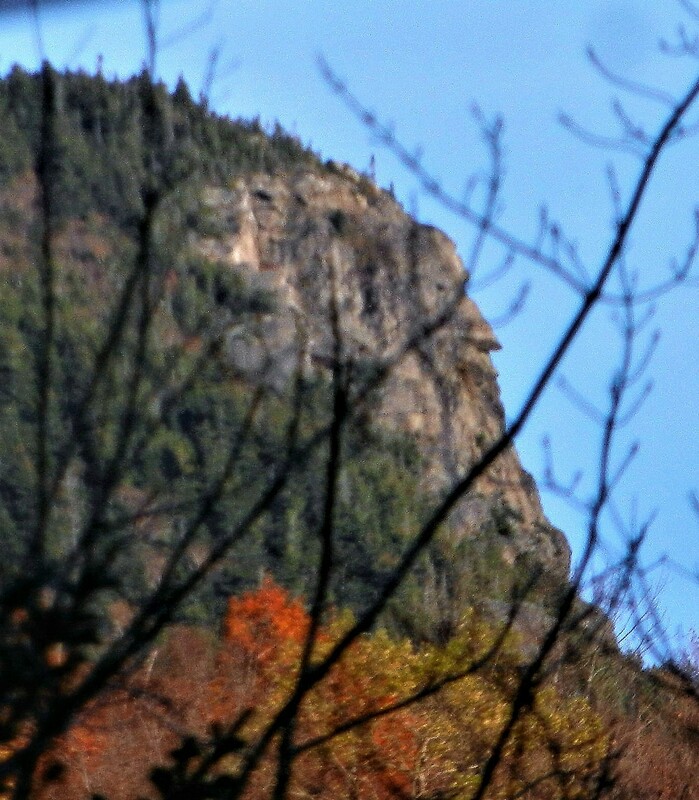 Willey is a 4255’ mountain in Crawford Notch and is named for the family that lived at it’s base in the early 1800’s. It’s a fun, challenging mountain to hike. But beware, before you head out you just may want to hear what others have encountered. These trails hide a secret that has become part history,part legend. In 1826 Sam Willey Jr. and his wife ran an inn at the base of the mountain. After a drenching rainstorm during the early morning of August 28th of that year three slides crashed down the side of the mountain. The southernmost slide was headed straight for the Willey house. Sam, his wife, five children and two hired hands all ran from the house attempting to flee their doom. Unfortunately as the mountain seemingly collapsed bringing boulders, trees and debris down into the notch the family and hired men were crushed to death. After a week long search, all bodies with the exception of three of the children were recovered. Those children’s bodies were lost forever to the ravages of Crawford Notch. In heartbreaking irony, the slide that was headed for the family hit some boulders behind the house. It broke into two slides and instead of crushing the house it went around it leaving it untouched. The slide then rejoined again in front of the house. The house remained unharmed as everything else surrounding it was tragically destroyed and swept away into the notch. Had the family stayed put, they would have survived. Sam’s brother had a dream shortly after the tragedy. In this realistic dream Sam told his brother that he was trying to lead his family to higher ground. Since the Saco River was rising so quickly he was afraid it would sweep the entire house away. Sam’s brother is convinced he heard this message directly from Sam from beyond the grave. The headstone marking the grave of the Willey family. It sits behind today’s Moat Mountain Brewery. Is Sam Willey still hanging around the notch trying to communicate to others? It’s been said that while hiking on Mt. Willey strange noises are heard. People have reported hearing moans, cries and laughter while hiking there. Some have seen strange lights. People have reported terrible gut wrenching odors only to have the odor disappear as quickly as it came on. A fellow hiker tells her story of hiking Mt. Willey. She was hiking solo on Ethan Pond Trail and didn’t run into another soul on the trail that day. It was strangely quiet, no wind, no birds, no noises at all. As a sudden gust of wind picked up out of the blue she saw another hiker approaching her. As the wind stopped just as suddenly, that hiker vanished before her eyes. She is sure of what she saw. It’s no small wonder that the term ‘the willies’ is originated from the events surrounding the Willey tragedy. What is causing the disturbances in those woods? Is it wind and active imaginations? Or is it something more sinister? Could it be Samuel Willey coming back from the grave to take revenge on the mountain that took his family? Perhaps it is Nancy Barton who froze to death in the area in 1778 or her lover Jim that went mad with guilt and sorrow after her death. Could it be one of the exhausted loggers searching for his old logging camp near Ethan Pond? Is it one of the three Willey children whose bodies were never recovered? Legend has it these children run madly through Crawford Notch harassing unsuspecting hikers. All stories for another time perhaps. Until then, stay alert out there and happy trails. There are a few routes to hike Mt. Willey in this area. Ethan Pond Trail to Willey Range Trail (1.6 miles) to the summit (1.1 miles). Ethan Pond Trailhead is at the end of Willey Station Road off of Route 302. You could also take Kedron Flume Trail to Ethan Pond Trail (1.3 miles) and then on to Willey Range Trail. Kedron Flume Trailhead is at the Willey home site on Route 302. Many resources list this hike as moderate but many agree that Willey Range Trail is difficult due to it’s steepness and tough footing. Always ensure you bring the 10 essentials with you and check weather forecasts before hiking. There are portions of this trail that could be hazardous in wet and/or icy conditions. This one is not for the faint of heart. If you want to explore this area, grab a camera and hike up Mt. Willey via Kedron Flume Trail or Ethan Pond Trail. I hiked Ethan Pond Trail to Willey Range Trail to the summit and back the same way. Ethan Pond Trail starts off quite pleasant with moderate grades and easy footing. Willey Range Trail begins to get very steep. Breathtaking views from the top. There are two outlooks, one overlooking Crawford Notch and the other overlooking the Pemi Wilderness. A memorial sits on the site of the original house. Hiking Mt. Willey left me feeling closer to Crawford Notch history and with a tremendous amount of respect for the Willey family and their story. I hope you enjoy it as much as I did. Happy Trails.